ELLIOT LAKE -- Elliot Lake's new Victim/Witness Assistance Program (VWAP) office will provide much needed services to the most vulnerable victims and witnesses of violent crime. Is available free of charge throughout the criminal court process. Located at 31 Nova Scotia Walk and in the same building as the local courts, the new office is expected to serve 150 people annually. 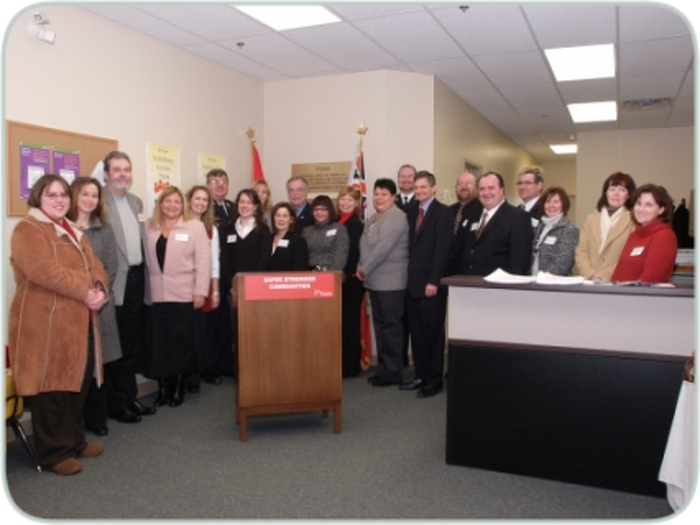 Attorney General Chris Bentley, accompanied by Algoma-Manitoulin MPP Mike Brown, opened the office today. "These new facilities will be a boost to the victims and witnesses who need our support while making their way through the court process," said Bentley. "The Victim/Witness Assistance Program is a cornerstone of the services provided to victims of crime in Ontario, and I am pleased that their services will now be available right here in Elliot Lake," said Brown. "Having a VWAP office in Elliot Lake is a huge support for victims and witnesses of crime in this area," said Jacqueline Wood, VWAP manager responsible for the Elliot Lake office. "They will be able to access valuable services in their own community at a safe and secure location." While in Elliot Lake, the Attorney General also announced funding for a project to address hate crimes. The Sagamok Anishnawbek Health and Social Services, based in Massey, will develop a youth justice circle to enable community discussion about hate crimes and violence. The $44,000 project will involve victims, parents, youth, elders councils, youth councils and frontline workers. The project will raise awareness in the community of hate crimes and related youth violence . The grant is part of the $1.35 million Community Hate-crime Response Grants (CHARG) program. "I would like to thank the Government of Ontario for supporting our work with this grant," said Anna Marie Abitong, Chairperson of Sagamok Anishnawbek Health and Social Services. "Their help will allow us to address the impact of hate crimes in our community." 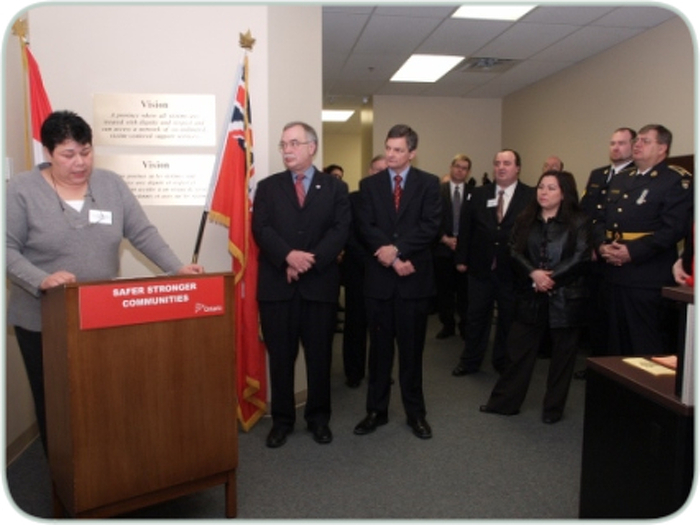 "Our government is working to empower victims by helping to provide the tools needed to overcome adversity, " said Community Safety and Correctional Services Minister Rick Bartolucci. " While there is still work to do, we are moving in the right direction and I am proud of investments such as this, which is reflective of our commitment." This document was published on January 24, 2008 and is provided for archival and research purposes. Mike Brown, MPP for Algoma-Manitoulin, Attorney General Chris Bentley, and other justice system partners look on while Anna Marie Abitong, Chairperson of Sagamok Anishnawbek Health and Social Services (left), speaks about her organization’s plans to develop a youth justice circle to enable community discussion about hate crimes and violence, thanks to a $44,000 grant from the province. Attorney General Chris Bentley is joined by justice system partners at the opening of a new Victim/Witness Assistance Program office in Elliot Lake today.